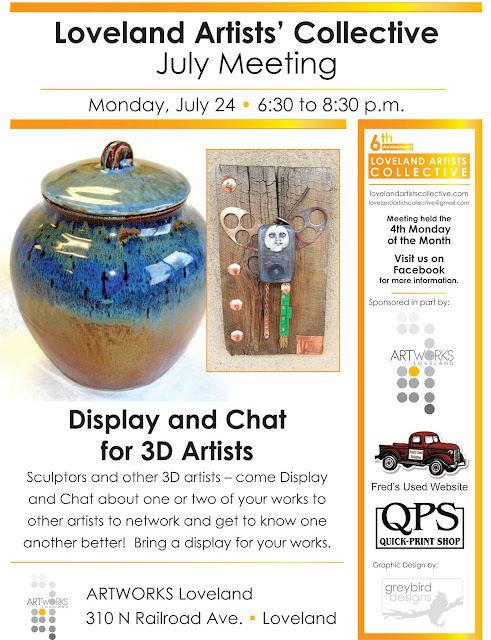 The Artists Collective: Sculptors, jewelers, fiber, assembly and other 3D artists - come Display and Chat at ArtWorks! Sculptors, jewelers, fiber, assembly and other 3D artists - come Display and Chat at ArtWorks! To display your work, please email us at lovelandartistscollective@gmail.com. Tell us your name and approximate size of your work. You are welcome to bring several pieces of work. Be prepared to tell us about your work and how you work and what inspires you, plus anything else you'd like to share. Please bring your own displays, as needed. There are a limited number of pedestals at ArtWorks available, you will need to haul them out and put them away. All artists, please attend to get to know your fellow artists better!!! To help increase the fun, please volunteer to help!